I got a response from a friend of Yuki's via Yuki. Call that snow? Hmmm.... a dusting. A dusting, true, but remember we are in a severe drought year. This is only the second snow of the season when we usually get 8 or 9 a year. The first one was on December 7th (note that was Pearl Harbor Day) and we got 7 1/2 inches. Those of us out here in Northern California are proud of what we call Sierra Cement. It feeds all those reservoirs and allows us to fish 12 months a year. So I thought, as a kind of rebuttal, I'd post a couple of pictures from years past. Enjoy. In the one below we got 5 1/2 inches. Not a lot, but enough to screw up the satellite dish. On 2-23-2011 we got 8 inches. Not the most, but a healthy dose. May 15, 2011 we only ended up with 3 inches this time. February 20, 2013 we had 6 inches. Still not a lot. 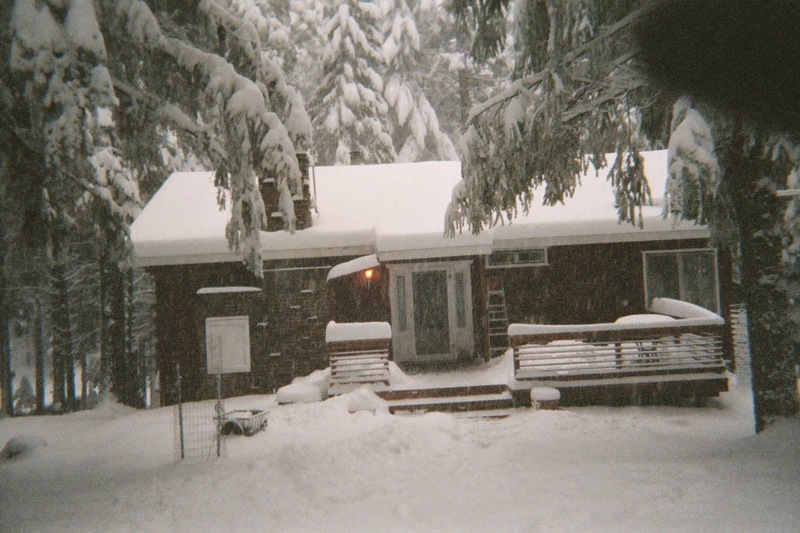 But on March 11, 2006 a year and a half after moving up here we got this storm. By the time it was all said and done, we had 24 inches on the ground. I made a run over to Pine Grove for a few supplies Saturday morning and was pushing snow over the hood of my Chevy pickup. That was a lot of snow. So yes, we got dusted yesterday and again this morning, but we're holding on to every flake. They did a snow survey yesterday and the Central Sierra is 34% of normal for this time of the year. Going to be some dismal fishing this summer. Might have to take up chasing Bass just for something to write about. Nothing wrong with some LMB action. I hear you, Mark, when it comes to more moisture. Really sad to see the difficult situation that you folks from California are in for. As far as Bass goes, get them on a fly rod, too! I would. I agree with Mel. Bass on a fly rod is a hoot! Do you know that "Yuki" means "Snow" and/or "Happiness" in Japanese? Want some snow? I can fill the back of the truck and bring it to you next time we fish. We're not quite done down here. Still no flowers on the Dogwood. Yikes.....5-31-06 and that much snow. I thought Maine was bad. Between March and May, 2006 was very white.